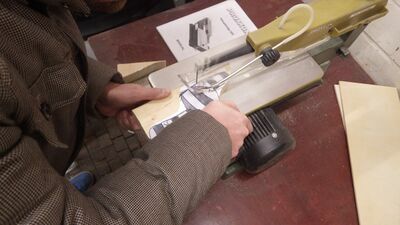 A scroll saw can be described as a powered fretsaw: two arms at the top and bottom hold a thin saw blade and vibrate quickly. The workpiece is pushed through the otherwise stationary saw blade to cut. It is a very versatile tool and can be used to cut wood, plastics or many metals to obtain intricate shapes. For larger pieces with wider curves you may want to use a jigsaw. Don't forget to wear personal protection and hook up a shop vac when you use it! Saw blades have to be changed frequently due to wear, different materials or simply because you want to cut a hole and have to enter the workpiece. We use quick-release saw blades with pins on both ends, do not screw these in or they will break! Saw blades without pins have to be secured by screws on both arms of the machine. The teeth of the saw blade always have to point down and a hole will need to be at least 5.3 mm in one direction for the blade to fit through because of these pins. Your material and to some extent also the design you want to cut dictate which saw blades can be used. Caution with acrylic glass: the material tends to weld the cut closed due to the high temperature being generated and thus prevents backward motion - make sure you will be able to cut in one go or you might get stuck! Consider drilling relieve holes along the cutting path to allow for easy turning and exit points. Also cutting straight lines into acrylic glass tends to result in wave-like patterns as the blade is flexible and therefore oscillates around the cutting path. Even for a "free-hand" design you make your work easier if you sketch the cut on your workpiece, e.g. with a pencil on wood or a scriber on metal and plasic. For printed plans, the easiest option is to glue them onto the workpiece - with glue sticks (they're water soluble) or onto a layer of masking tape which should later peel off without a trace.